Stine Gam was born in Copenhagen, Denmark in 1975. She is educated architect with a master in furniture design. Enrico Fratesi was born in Pesaro, Italy in 1978. He has studied architecture and graduated with a master in industrial design. Gam and Fratesi gained experience as architects in several architecture studio in Japan and Scandinavia before establishing their own design studio in 2006. The studio is based in Copenhagen, though Gam and Fratesi are continuously traveling between Italy and Denmark for development and research of new projects. 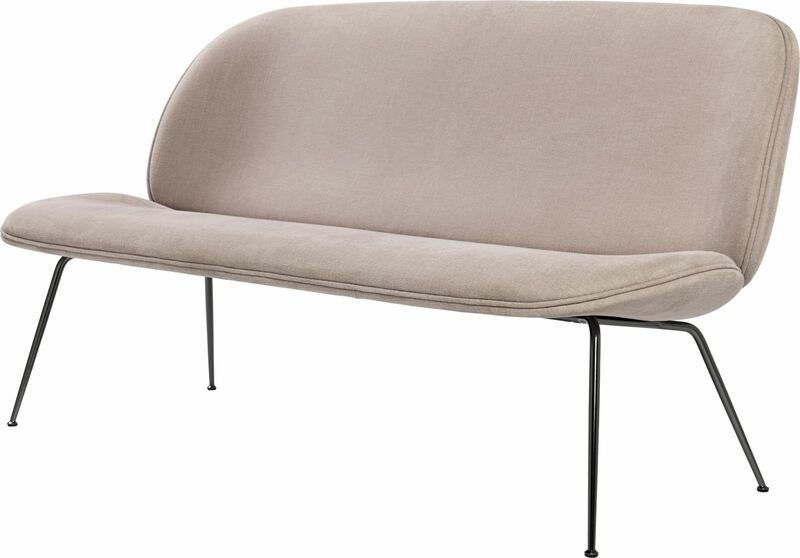 GamFratesi’s design takes its creative drive from a fusion of tradition and renewal and in an experimental approach to their chosen materials and techniques. With their dual traditional background, Stine Gam and Enrico Fratesi draw on the classic Danish furniture and craft tradition as well as the classic Italian intellectual and conceptual approach. Understanding a tradition and addressing it actively in the workshop makes it possible to expand on it. From this cross-cultural substrate they create furniture that respectfully reflects tradition while also featuring unique embedded stories, symbols and associations, often expressed in a minimalist idiom. GamFratesi aim to create furniture that illustrates the process and the techniques that created it, and which reflect a persistent exploration of the diverse border zone between harmony and disharmony. GamFratesi have received significant awards including Elle Decoration International design award (EDIDA) as International Young Designer of the Year 2013, Guest of Honor Stockholm Furniture and Light Fair 2014, selection Compasso D’oro / ADI , Nomination Best Designer Icon design award 2014, Vico Magistretti Award by De Padova, the Chicago Atheneum Museum of Architecture’s Good Design Award, Best Danish Designer 2012 by Bolig magasinet, ‘Walk the Plank award 2009’ and Best Danish Designer 2009 by RUM. Their work have been shown in numerous exhibitions, Triennale di Milano, solo exhibitions at the Museum of Art and Design Copenhagen, Art Museum Trapholt Kolding, Palazzo Litta, Shanghai as well as collective exhibitions Mindcraft in Milano, Royal Danish Embassy in Tokyo, and Design Miami/Basel. Dimensions W140 x D80 x H81 cm. Seat height 36cm. Seat depth 53cm. 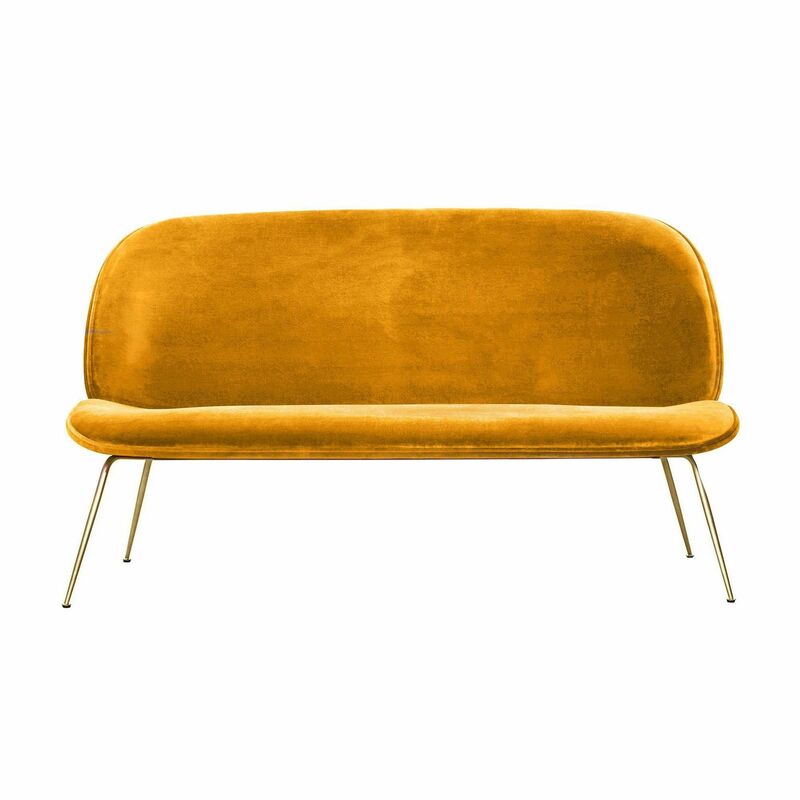 The Beetle sofa can be customised by the choice of fabric and colour, as well as the choice of base: brass, black chrome or black painted steel. 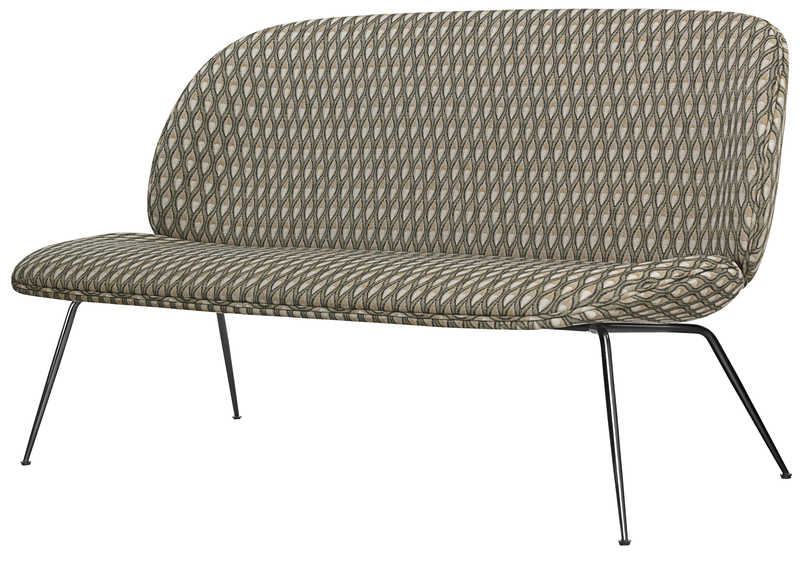 You will find below a preselection of fabrics particularly suited for this sofa. Besides their intrinsic characteristics, fabrics are distinguished by their price category: groups 1, 2, 3 and 4 (increasing prices). Do not hesitate to contact us to talk directly of your project. We also have at your disposal a wide collection of fabric samples, we will gladly send it you free of charge (against deposit). For more customization options, please contact us. 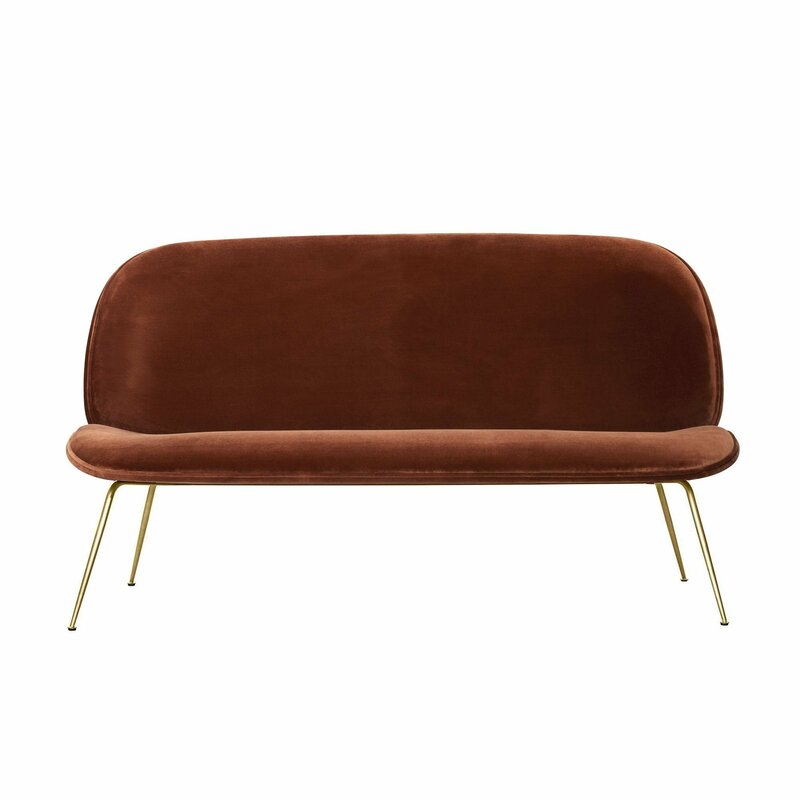 The Beetle 2-seater sofa invites conversation. Taking its inspiration from the Beetle Lounge Chair, the elongated Beetle Sofa plays with the contrast between the enveloping outer shell and a soft, inviting interior which encourage to be seated. 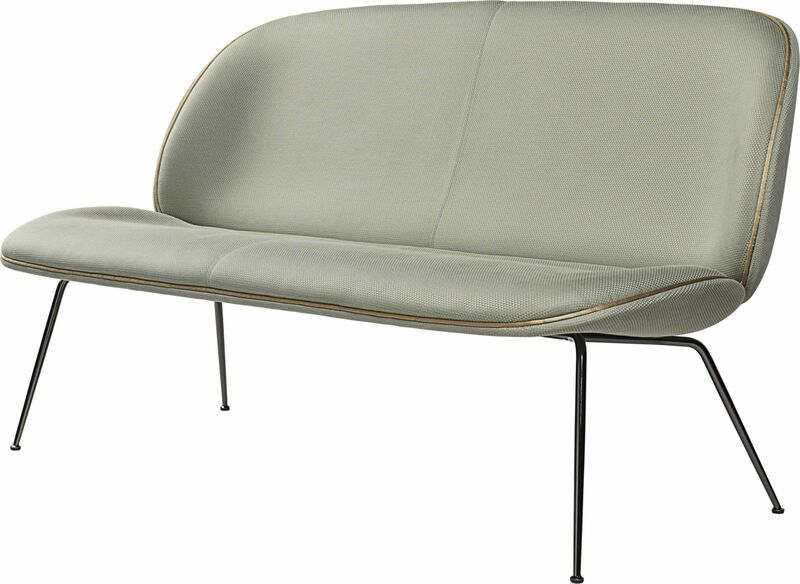 The 14mm thick shell structure, is always fully upholstered with fabric or leather. At the same time compact and visually light, the shell is supported by 4 thin and slightly conical legs, available in black, brass or black chrome.